Teacher Created Resources OS EP60348 - Simply rotate the Skateboards under the Pete pieces to assign jobs for the day or week. Includes teacher guide with activities & reproducibles. Largest piece measures 21" x 6". Set of 47 pieces. Get students excited about helping out in the classroom with this groovy job chart starring Pete! includes 10 Pete sign pieces for jobs, 36 Skateboards for student names, and "we're groovy Helpers!" banner. Teacher Created Resources OS EP63649 - Largest piece measures 20-1/2" x 5-1/2". Birthdays are groovy when you celebrate with Pete the Cat! includes "birthdays are groovy!" banner, 12 month headers, and 36 pieces for student names. A teacher guide with activities & reproducibles included. Set of 49 pieces. Teacher Created Resources OS EP63370 - Laminate them for use as vocabulary flash cards or word bank labels. Help teachers and substitute teacher learn names. A teacher guide with activities & reproducibles included. Set of 49 pieces. Largest piece measures 20-1/2" x 5-1/2". 36 per pack. Set of 36 2-3/4" x 9" nameplates. Purrfect for labeling desks and cubbies! use them to learn students' names or to label learning centers, storage areas, and Portfolio collections. Measure 9" x 2. 75". Teacher Created Resources OS EP63939 - 36 per pack. Help teachers and substitute teacher learn names. Set of 49 pieces. Measure 9" x 2. 75". Measures approx 3-1/2" x 2-1/2". A teacher guide with activities & reproducibles included. 36 total pieces. 4 designs. Largest piece measures 20-1/2" x 5-1/2". Perfect for name tags, student portfolios, gift tags, award badges, field trips, first days of school, cubbies, parties, parent visitations, labels, and scrapbooking. Teacher Created Resources OS EP63926 - Measures approx 3-1/2" x 2-1/2". Visual reminder for students. Largest piece measures 20-1/2" x 5-1/2". Header piece measures about 20-1/2" x 5-3/4". 36 per pack. Help teachers and substitute teacher learn names. Measure 9" x 2. 75". A teacher guide with activities & reproducibles included. Shiny, protective coating for durability. 47 total pieces including 36 crayon labels for student names. 36 total pieces. 47 total pieces. Students get a visual reminder of what behavior is expected in the classroom-acknowledging good behavior and reminding them of when they need to improve their conduct. 4 designs. Let pete the cat help guide student behavior with this colorful mini bulletin board. Edupress EP63926 Pete the Cat How Am I Doing? Mini Bulletin Board - Set of 49 pieces. Teacher Created Resources OS EP-3236 - Set of 49 pieces. Measure 9" x 2. 75". Measures approx 3-1/2" x 2-1/2". Perfect for bulletin board displays, flash cards, name tags, and more!. Coordinates with other Pete the cat classroom décor that is available. Size is approximately 5. 25" x 7". Largest piece measures 20-1/2" x 5-1/2". Visual reminder for students. 4 designs. Package of 36, 6 each of 6 designs. A teacher guide with activities & reproducibles included. Shiny, protective coating for durability. 47 total pieces. Colorful button accents are perfect for Pete the cat bulletin board displays, name tags, flash cards, and more! accents coordinate with we're rocking in our learning shoes bulletin board. 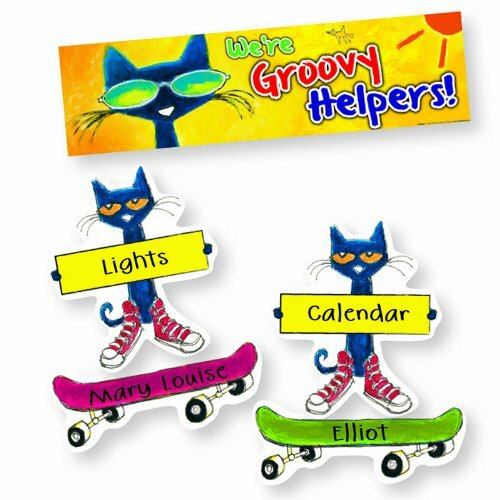 Edupress Pete the Cat Groovy Buttons Accents EP63236 - A bright way to add some color to your classroom. 36 total pieces. Help teachers and substitute teacher learn names. 36 per pack. Teacher Created Resources OS EP63950 - Largest piece measures 20-1/2" x 5-1/2". 4 designs. Visual reminder for students. This pete the cat bulletin board is a colorful visual reference for students learning their alphabet and numbers. Includes 26 alphabet cards that measure 5-1/2" x 8-1/2" and number cards 0-10 that measure 4-1/4" x 5-1/2". A teacher guide with activities & reproducibles included. 47 total pieces. Shiny, protective coating for durability. 37 total pieces. 36 total pieces. Help teachers and substitute teacher learn names. Set of 49 pieces. 36 per pack. 37 total pieces. Shiny, protective coating for durability. Measure 9" x 2. 75". A bright way to add some color to your classroom. 26 alphabet cards and 11 number cards. Edupress EP63950 Pete the Cat Alphabet Bulletin Board - Measures approx 3-1/2" x 2-1/2". Perfect for bulletin board displays, name tags, flash cards, and more!. Coordinates with other Pete the cat classroom décor that is available. Teacher Created Resources OS EP62383 - 47 total pieces. 36 per pack. Measures approx 3-1/2" x 2-1/2". Shiny, protective coating for durability. Teacher guide with activities & reproducibles included. 36 total pieces. Largest piece measures 18" x 12". Largest piece measures 20-1/2" x 5-1/2". Perfect for bulletin board displays, flash cards, name tags, and more!. Coordinates with other Pete the cat classroom décor that is available. Pete the cat motivates students to learn with a rockin' classroom bulletin board! includes "we're rocking in our learning shoes" banner, 36 colorful shoes for student names, "cool Zone" sign, and accent pieces. Visual reminder for students. Edupress Pete the Cat We're Rocking in Our Learning Shoes Bulletin Board EP62383 - 46 pieces. Set of 49 pieces. 4 designs. A bright way to add some color to your classroom. Measure 9" x 2. 75". Shiny, protective coating for durability. Help teachers and substitute teacher learn names. 26 alphabet cards and 11 number cards. Teacher Created Resources OS EP60325 - 36 per pack. Visual reminder for students. 4 designs. Shiny, protective coating for durability. Teacher guide with activities & reproducibles included. A teacher guide with activities & reproducibles included. Help teachers and substitute teacher learn names. A bright way to add some color to your classroom. Largest piece measures 20-1/2" x 5-1/2". 26 alphabet cards and 11 number cards. Measure 9" x 2. 75". 36 total pieces. 47 total pieces. Use colorful border trim to liven up your classroom! create fresh looks for bulletin boards, walls, windows, and class projects. Set of 49 pieces. 35" x 3 ". Shiny, protective coating for durability. Perfect for bulletin board displays, name tags, flash cards, and more!. Edupress Pete the Cat Straight Border Trim EP60325 - Coordinates with other Pete the cat classroom décor that is available. 46 pieces. 37 total pieces. Shiny, protective coating for durability. Teacher Created Resources OS EP62639 - Durable card stock. 36 per pack. Package of 12. 4 designs. A bright way to add some color to your classroom. 36 total pieces. Help teachers and substitute teacher learn names. Teacher guide with activities & reproducibles included. Measure 9" x 2. 75". Banners measure 16" x 48". 26 alphabet cards and 11 number cards. Shiny, protective coating for durability. Shiny, protective coating for durability. A teacher guide with activities & reproducibles included. Visual reminder for students. 35" x 3 ". Shiny, protective coating for durability. Perfect for bulletin board displays, flash cards, name tags, and more!. Coordinates with other Pete the cat classroom décor that is available. Edupress Pete the Cat Welcome Banner EP62639 - 37 total pieces. Largest piece measures 20-1/2" x 5-1/2". Perfect for entryways and hallways! invite students into your learning space with this colorful welcome banner. Largest piece measures 18" x 12". Measures approx 3-1/2" x 2-1/2". Teacher Created Resources OS EP63268 - A bright way to add some color to your classroom. Largest piece measures 20-1/2" x 5-1/2". Use colorful border trim to liven up your classroom! create fresh looks for bulletin boards, windows, walls, and class projects. Set of 49 pieces. Visual reminder for students. Banners measure 16" x 48". Measures approx 3-1/2" x 2-1/2". Help teachers and substitute teacher learn names. 47 total pieces. 35" x 3 ". Shiny, protective coating for durability. A teacher guide with activities & reproducibles included. 26 alphabet cards and 11 number cards. Shiny, protective coating for durability. Measure 9" x 2. 75". 4 designs. 35" x 3 ". 46 pieces. Perfect for bulletin board displays, name tags, flash cards, and more!. Edupress Pete the Cat School is Cool Straight Border Trim EP63268 - Coordinates with other Pete the cat classroom décor that is available. 37 total pieces.